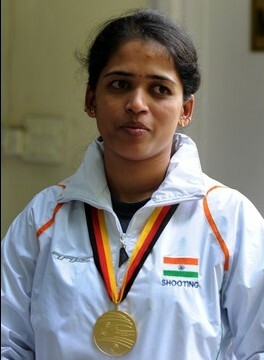 The new pearl in the necklace of Mother India who has succeeded in grabbing the Gold at the World Shooting Championships at Munich in 50m rifle prone event. The pearl shines all the more with the World Record set in her name at the same time. Away from the facilities of a metropolitan city like Mumbai, Tejaswini never gave up her practice or dedication towards the game. It is more interesting to know that inspite of inadequate facilities for training, she managed to continue with a very unusual sport, and achieve the best in it. Tejaswini is really cool and level headed. After the success and accolade she is now heading confidently for the Common Wealth Games, beginning this October. Coming from a city like Kolhapur (Maharashtra) she has proved to all that dedication and jest can make wonders. After the initial applauds of prizes and felicitations, the Government should look more seriously into providing more advanced facilities for sports. Also the upcoming sportpersons need to be given more support and advanced equipments for training. All the best for future..
2) You are in Ahilya Sangha, Bal, Parade consultant, why not you start atleast one postin a week in this field. There are lot of subject like Parade its importance, Bal and todays lady, Importance of self defense and lot other so think on this. Also ask comments from your followers on this post. 3) Also start some post on general knowledge of your interest. Or any activity that you are interested in this will cause your friends to read those post.